A football jersey enthusiast who hails from Malaysia and currently learning the trade of drug dealing in Australia. Why did you have to leave so early? I told you before i leave for Adelaide that i will return to visit you again, but looks like i won't have that chance anymore. When i leave, i remembered clearly our goodbyes. When i was about to leave, you gathered every ounce of strength you had to lift up your arms and waved gently at me. Little did i know that would be your last goodbye to me. I received a text message from mummy around 10.30am on the 23rd, she told me you passed on. I was shocked, i was stunned. I don't know what to say. I called back and talked for a while with mummy. She said your heart was weak. I then asked her if i need to go back. She told me no need, dad and the kids are not going back as well. She said that you would understand. That's when it hit me hard. You are always understanding. Even when i know you wanted to talk to me, you would understand when i told you "I need to go eat" or "I need to take a bath". You would smile and nod, and let me do my things until i get another chance to talk to you and spend time with you. Each time i appear in your room and call you, you would smile with the sweetest of smile, a smile that is of pure joy, a smile that will bright up that dim room you have been in for the past 2 years. Now whenever i go back, that room will appear dimmer than ever to me. I still remember when i was a small kid, a naughty one. Mummy would chase me around the house with a rotan in her hand. I would run and hide behind you, and you would put your arms around me, and asked mummy to stop. That time, you appear as a gateway to safety for me. But now i know it is because of your love to me, and to all of your grandchildren as well. Your love and care have always being a part of my life, from the moment i was born till now. I see you almost every week for the past 18 years before i leave for my studies, and even when i arrive back in Bintulu during the holidays for the past 2 years, the first thing i did once i enter the house is to visit you in your room. It will be very different the next time i go back. Do you remember the last time i went back in February? That night you can't sleep, and i promised to you that i would accompany you and talk to you. However i had to leave the room as we all need to get some sleep. Yet you can't fall asleep, and continue to look for me, calling my name "Chiang Chiang", over and over again. Jee Ee told you that i was asleep. I hope that you do not think that i abandoned you, because that is far from the truth. I was lying on the sofa outside, dozing off and waking up to each of your call. It hurts me to hear you calling my name yet unable to answer you back. I am sorry for not being there for you when you wanted me to Ah Ma, and i would never abandon you. But i know you would understand, that's your greatest of many virtues. I know someday, somehow, i will see you again. And at that time, i am sure i will be greeted by that warm smile of yours again, radiant by nature. 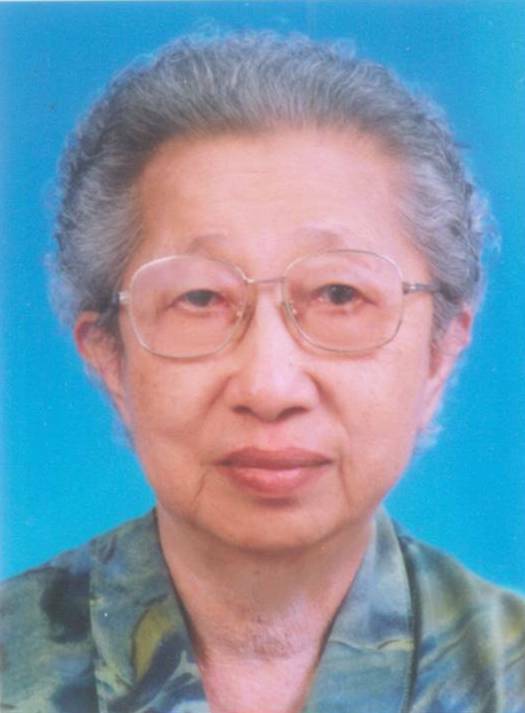 Until then, i hope you rest in peace Ah Ma, because after all your hard work on Earth, you deserve a place up there with the Lord, filled with joy and prosperity that you fully deserve. I'll miss you. a bunch of booklets were passed down the aisles along the seats for the Pharmacy students to read. I got myself a copy. It's the 1st issue of the Mortar and Pestle for the year 2010. Cant believe my last post is like more than a month ago. And from then until now, so much had happened. I spend another few weeks in Doha before flying back to Bintulu. Spend 1 week with Ah Ma and aunts, as well as heaps of gatherings and plans with good old time sec school friends, went back to Adelaide to prepare myself for the new semester, and now here i am, second day going to third in the start of my 3rd year life. What awaits me this year? I know for sure my grocery shopping is made tougher for at least the next few months, the nearest Woolworths supermart to my uni is closed for renovation. Read back some of my previous post, and it hit me now why i do not post as much. I lost the sense of witty writing. I find that i write in a very "smart", witty way which some may find annoying, while i personally find funny. HAHAHAHAHAHAAA!!! yeah, funny. I don't feel like i am doing that a lot now, thus lesser fun in blogging. Now i am just stuck blank starring at the screen. See? thing's just doesn't flow out anymore. I guess that's the cue for "Sayonara!" It was a Monday morning i woke up as usual around 10am, only for my mum to ask me read the day's paper. Trust me, you'll never see me any excited just minutes after i woke up. I spend the next few hours trying to search for information in the net from forums, Aspire academy's website, Man Utd club's website and online news sites but to no avail. All i know from the morning paper is that the team are having a 4-day training trip in Doha to get away from the freezing weather of UK, and they will be training at the Aspire Academy, a state-of-the-art training ground. I even send a message to the United's website about any meet-the-fans event scheduled, but was disappointed by the reply. My message to Aspire on the other hand, are still unreplied till this day. So as fast as i get excited over the arrival of the team, i conceded that there is no way for me to see them, let alone meet them. It is not until Tuesday evening that i start looking around in the net again. 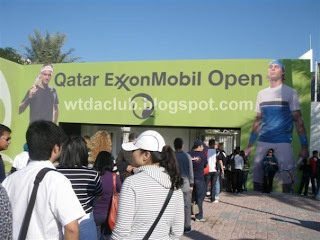 I came across a local forum Qatarliving.com and from there, i discovered that some of the locals have went to Aspire that couple of days and managed to see the team from far. One helpful member, only known to me as Saddavi, actually emailed me after seeing my reply in the forum. He told me that the club most probably start training at 10am, and he is helpful enough to tell me exactly where the players will be training. Things started to look brighter now. Last but not least, i asked my mum if she can drive me to the training ground. After her walk with Auntie Vera, she told me that Auntie Vera said she could drive me there and the rest of them (Auntie Vera, Mum and Selene) go shopping at a shopping mall nearby. So as everything looks set, i borrowed my brother's bag and phone, load the bag with marker pen, water bottle, a map of the training ground and a Wayne Rooney autobiography book, and hope for the best. So on Wednesday i woke up, put on my Man Utd jersey and after Auntie Vera's car arrived, make my way to the Aspire Academy. Upon reaching at 9.45am, i walked towards the football fields according to the map. When i reach the area, i looked around and there, in the middle of all the fields available, is one that is fenced up with several security guards on the perimeter. Should i go there to test my luck, i asked myself worrying that i will make a fool of myself after being chased away by the security. I decided to walk and approach one of the securities, and i asked, "Can i watch the training from here?". The security said i can, just don't cross the barriers. So from there, far away i saw with my own eyes, the presence of club manager Sir Alex Ferguson (SAF) and assistant manager, Mike Phelan. The man who kept the club running for 23 years, and his assistant. Yes, that far. And that's after i max zoomed my camera. But good enough, at least can see them with my own eyes. Or so i thought. You see the chairs around the tunnel near the few humans there? i asked the security there who is it for, and can i go there? He told me its for VIP and Qataris, and told me no because i wouldn't want to mess with the Qataris. I concur. At around 10.30am, a few officials in suits walked to my direction and talked a bit with the security guard, then told me "You cannot watch from here". Gosh, i only saw the Manager and assistant, haven't even see the players yet. So much for an eventful day. "Go up to the chair and have a seat" The officials continued. I can hardly believe it, i double asked the officials and security before thanking them multiple times. Oh wow, oh wow, oh wow. 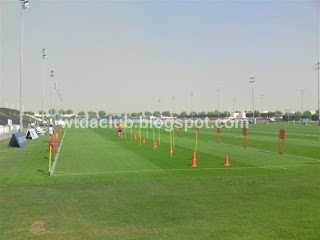 The thing is, without me knowing a single detail, that Wednesday is the third and last day of training and they decided to make it into a public training session, which means public is allowed to watch them train. Quickly i walked up the stairs and onto the seats just in time to catch the players coming out of the tunnel. I was trying my best to alternate between looking at the players with my own eyes, taking pictures of them and calling out their names as they came out one by one. Some just walked pass without paying much attention, some nod and smile and a couple friendlier ones waved back. After they are all out on the field, i chose a good seat to watch them train. Here are the players that i watched on tv and online stream playing football in UK, winning trophies after trophies, crowned English, Europe and World Champions just a year ago, right in front of my eyes. This is every fan's dreams. While i was seated, i looked around and i spotted another famous football figure among the spectators. 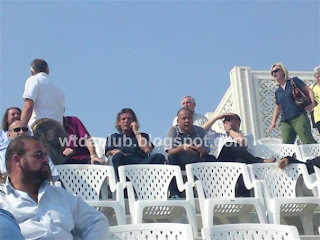 That guy in the middle with long hair is Bruno Metsu, manager of the Qatar national football team. Avid football fans will recall that this is the man that brought Senegal to their first ever FIFA World Cup in 2002, and in their first ever match, beat the 1998 World Cup Winners France and is considered as one of the biggest upset of the tournament. But surely even his presence is shadowed by the world renowned team training on the field. To start of with training, the players jogged to warm up. Then, they have light passing drills to keep their engine running. It's here that you will see weird but nice partnerships between the players. In the picture below, you can see Ryan Giggs, a veteran Man Utd player since 1991 (1987 if youth team is considered), training with Rafael, aged 19 who just arrived at the club more than a year ago. Their age difference is an amazing 17 years. To put it in perspective, When Ryan Giggs are playing youth matches for Man Utd and are looking to break into the senior squad, Rafael isn't even born yet! 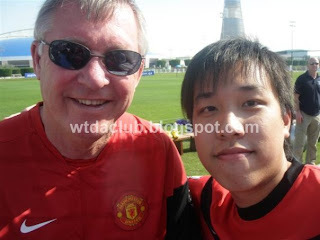 There's also Patrice Evra from France and Park Ji Sung from South Korea training together. Their friendship and ability to joke and fool around even though they are so much different in race, culture and language are well known among United fans. After the light passing drills now they move on to set piece and tactical training. In this training, they will train scenarios where a couple defenders will defend and a few attackers will pass the ball from the wing, cross the ball in and try to score. They will do this over and over again, partnering different teammates and trying different passes. Halfway through the training, Saddavi arrived. Prior to the event, Saddavi told me to give him a text if i manage to catch the team, so i did. 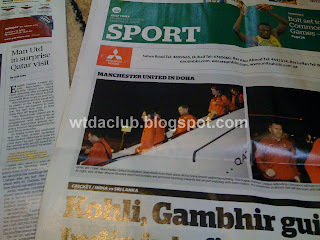 We introduced ourselves for a bit and talked about Manchester United since he is a fan as well. Due to work commitments though, he is unable to join me any further and had to leave. All thanks to this guy, without his help i would not even plan this trip in the first place. After everything is done and to end the day's training, the players have a small pitch match practice, where they will play a short match. 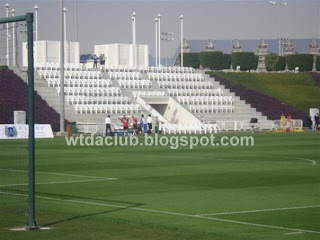 Training ends at around 12pm, and the players moved towards the bench where they can sit, have a drink and cool down. Thats when i leave my seats and walked towards the barriers. I managed to fit myself next to a fat boy, and wait there for a chance. A chance to get the player's autograph! As expected, soon the players approached the fans. The first player that came up to us is Paul Scholes, a player that had played for Man Utd his entire career, just like Ryan Giggs and club captain Gary Neville. Soon, others followed suit. When the players approached me, i gave them my marker pen, lifted up my shirt and hold it tight for them to sign. 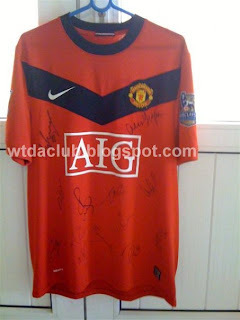 Yeap, as a jersey collector i always make an effort to have my shirt signed by players if i happen to meet them. If you follow my blog you'll surely know of other occasions i have players sign my shirt. 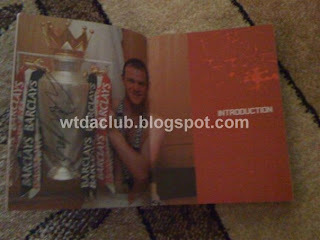 When Wayne Rooney came up, i took out his autobiography and asked him to sign it as well as my shirt. As for pictures with the players, i did have a few although i wished i had taken more. This is because i was busy getting my shirt signed and they are moving fast from one fan to the other anyway. 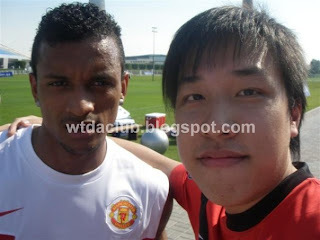 I managed to get a picture with the manager SAF and the Portuguese winger Nani. Looking back, how i wish i had taken picture with Ryan Giggs or Wayne Rooney, the few players that show such big commitment to the club. 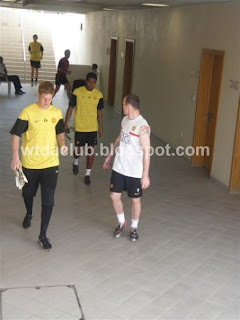 The last of the players, Rooney and Nani left after spending some time outside. That's when everyone started to leave the area. I walked out towards the mall to catch a cab back home. I swore i am beaming all the way there. To complete my lucky day, The taxi driver that drive me is the same driver that bring me from the airport to my home when i first arrived in December! He still remembers me, know that i am from Malaysia, and my parents are working here. He even remember how to drive about to my house once inside the Nine Pearls Compound. That's one of my life dreams came true, and i truly felt lucky and blessed to have such opportunity. Not only that, from a simple "see the players" turned into a meet and autograph sessions with the players, totally out of my imagination. Hopefully there will be more of such events in my life. I guess this post is a long time coming. 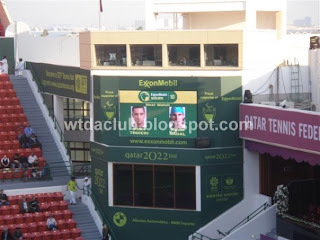 Its nearly a week ago since I went for the Qatar Open Tennis tournament. Actually, i've been wanting to go since 2009 but last year we were late in buying the tickets and they sold out pretty fast. After all, for a ticket price of only QR50 (RM50 or so) for the cheapest seat for Semi-final, it is comparatively cheaper than Wimbledon or Australia Open. This year round, we got the ticket earlier and even then, the better seats were sold out. 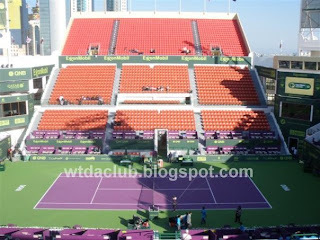 We managed to get the QR50 ones, but i would have gone for the QR70 ones for a nearer and wider view from the middle tier. 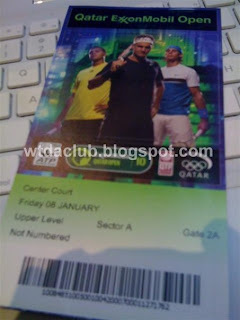 Anyways, come 8th January, all 5 of us head to the venue, Khalifa Tennis Complex Doha. The 5 of us were the 2 Ting sisters, my brother and dad, and of course me. We reached there earlier and we're in line for entrance. When the gate is opened, we made our way in through the security and finally got our seats as close to the court as possible. There we waited for about an hour or so for the start of the semi final events at 4pm. Soon the first match starts. It's a game between Viktor Troiki and Rafael Nadal. Nadal showed why he is the world's no.2 player in tennis, beating Troiki 6-1, 6-3 in only around 1 hour. From the looks of it, nobody can beat him in this form. Then comes the bladder problem. 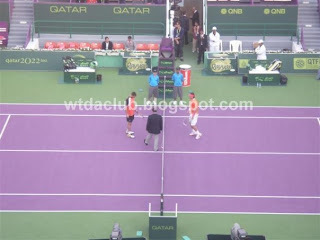 So my brother and I head to the toilet, and try to make our way back before the start of the second match between Nikolay Davydenko and Roger Federer. Due to the long line though, we just reached the top of the entrance to our seats before the stewards close it because during play, nobody is allowed to move, talk or cheer for anyone. So that means my brother and I were stuck there, waiting for the players to take a break for us to start moving again. For the second semi finals, Davydenko beat Federer by a score of 6-4, 6-4 in 81 minutes. 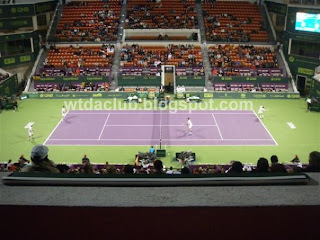 Throughout the whole match, they were evenly matched although i see Federer struggling a bit with Davydenko's serve. A couple of times Federer looks to be able to make a comeback, but alas Davydenko proved too much of a power for Federer to deal with. So Nadal and Davydenko for the finals. Last but not least, the finals for the doubles event between Garcia-Lopez/Montanes and Cermak/Mertinak. The former team won by a score of 6-4, 7-5. The match isn't that interesting, with half the full arena left before the match even starts. We stayed for a while before heading back midway through the match. For the finals, Davydenko beat Nadal 0-6, 7-6, 6-4 in a very exciting match which lasted nearly 3 hours! Nadal had a great start but soon worn himself out, and with persistent yet strong play from Davydenko he's able to win the game back. As for chance to meet the players or get something from them, it didn't come close enough. A couple of tennis balls that the players like Nadal and Davydenko hit to fans flew just short of us, either at the back or to the side. Not much luck on that day i guess. It was an exciting event to attend, although from far at least i saw tennis superstars in real life, hear Nadal's grunt when he hits the ball with my own ears and stuff like that. There, pic attached. The couple is not intended though, my point is the pic. I also can attach pics that I have taken earlier in the post. Ok then, off to play some iPhone games to kill time. Until my lappe charger reached me in Doha, I'll probably not blog that often. Cya! Some of you may know that i have finished my exam a few days ago. But why still no post update till now? Well, I'm busy moving place! Finally i'm moving out of Highgate Lodge and prepare a new life in a house rather than just a room. Mel wanted to rent the extra room out but nobody seems to enquire about it although the price is cheap, i wanted to move into a place that is already set up so no hassle in furnishing the whole house, so this seems like a win-win situation. So right after exam, i started packing and moving in the next couple of days. Also went to IKEA for furnitures to furnish my room, and had the whole yesterday assembling them, knocking and screwing until blister appeared on my right thumb. But all's worth it since my crib is now nearly done! Only left a mirror to set up and some other stuff that requires drilling, which i think will be done when i come back from summer vacation. On the left side would be where i display my jerseys, with a chest to store my cloths and random stuff in, while the top would be a display area as seen in the picture as well. Further plans include putting up some posters and my framed jerseys so the wall doesnt look so empty. Need to consult with Mel on how to go about with it when i get back next year, don't wanna ruin the wall. Last but not least, Thanks Mel for all the driving and carrying! Without your uncle's 4WD and your help in everything i doubt we can finish this shifting in 2 days! On some side notes, i'll be going back to Bintulu on the 34d/4th of December before heading to Doha for 2 months or so on the 7th. Coming back to Bintulu again on the 16th to celebrate the remaining CNY with friends and relatives before coming back to Adelaide for my 3rd year. Fingers crossed i dont have to alter this plan due to failing an exam :S Chow for now! I was at my desk, catching up on Crohn's Disease and Ulcerative Colitis, slowly sipping a cup of coffee while listening to Natasha bedingfield's songs when suddenly my mind roamed away. One thought led to another and now here i am, writing on my blog. Come to think of it, i was so active 2 years ago. Ideas would just come to me, activities properly planned and jotted down in this small blog of mine. From a simple project like buying a speaker to a big event like traveling all the way to Sunway Pyramid to meet the casts of Why Why Love, this blog would always be updated every 3 days or so. Visitors also increased to all time high, sometimes hitting 30 a day (not many to some but hey, good enough for me). It got so active to the point that i could easily earn money through my blog, more than 100 US Dollars for that few advert posts on my blog. I even won something from a blog writing competition (albeit consolation), a package that includes a series' OST CD, a bottle of beauty lotion (which i later sold for RM50), a polo shirt and some other small goodies. I wonder what changed. Busy? Not really, since i still got the time to sleep 10 hours today and watched lots of series. Lack of activities? No way, i think i go out for more gatherings and hang out with friends more than when i was back in KL. Take this 2 weeks break for example, countless birthday dinners attended (and will attend as well), 2 paintball sessions, and lots more random dinners with mates. I think it goes down to lack of passion. Guess i am not as passionate in writing as before. Used to snap pictures from my good ol' Sony Ericsson W700's 2MP camera wherever i go, thinking of pictures to put in my post. Not anymore, even when i have an Olympus u1040 10MP now at my disposal. Can't even be bothered to check how many people visited my blog, even deleted any advert opportunity from my inbox when the rare occasional offers come in. Oh well, at least you guys get to dive into my mind this time round, and get to read what i'm thinking at this very moment. Ever heard a R&B song and when the singer sings and their voice sounds robotic? like when they change the key u can hear distinct robotic or metallic part in it? Well they did it with a program called Auto-Tune. Auto-Tune is popularized by T-Pain, and now you can hear many singers use it, from Chris Brown to Black Eyed Peas. Now that i have an iPhone, i managed to get one of these software! 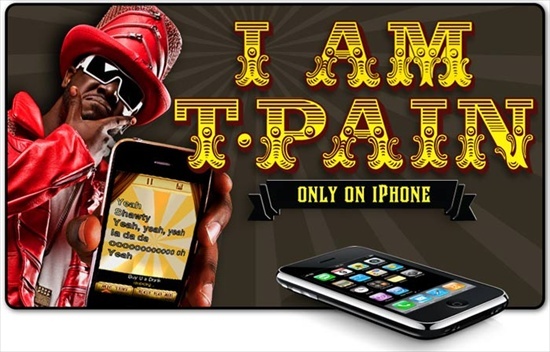 Called "I Am T-Pain", it allows you to sing into your phone and the output will be digitally altered to have those metallic sound to it. You can sing in a freestyle mode for songs that you create on your own, or u can download and play one of the few presets available, for example Kiss Kiss by Chris Brown. Now, i wonder which children is suffering from gastrointestinal reflux disease, hypertension and anemia to take these drugs.. Copyright © Welcome To Da Club • All Rights Reserved. This blog is a personal blog written and edited by me. This blog accepts forms of cash advertising, sponsorship, paid insertions or other forms of compensation. The compensation received may influence the advertising content, topics or posts made in this blog. That content, advertising space or post may not always be identified as paid or sponsored content. The owner(s) of this blog is compensated to provide opinion on products, services, websites and various other topics. Even though the owner(s) of this blog receives compensation for our posts or advertisements, we always give our honest opinions, findings, beliefs, or experiences on those topics or products. The views and opinions expressed on this blog are purely the bloggers' own. Any product claim, statistic, quote or other representation about a product or service should be verified with the manufacturer, provider or party in question. This blog does contain content which might present a conflict of interest. This content may not always be identified.